Mumbai terrorist attacks mastermind Zaki ur Rehman Lakhvi. 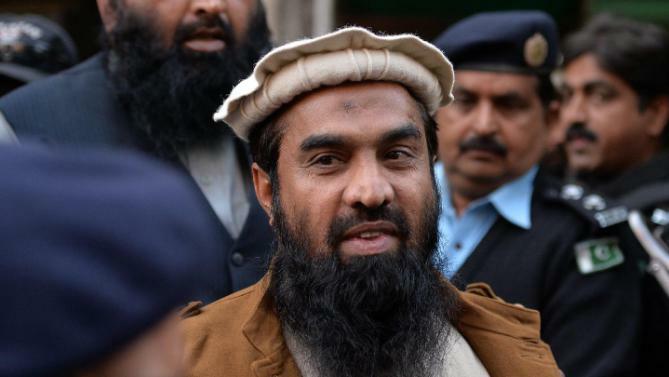 (TibetanReview.net, Jun25, 2015) – China saved the day for Pakistan at the UN on Jun 15 to India’s deep chagrin, preventing the world body from taking action against it for releasing on Apr 10 this year the 26/11 Mumbai terrorist attacks mastermind Zaki ur Rehman Lakhvi, 55. The attacks had left 166 people dead in India’s commercial capital Mumbai. India’s Prime Minister Mr Narendra Modi raised the issue with the Chinese leadership, informing Beijing how strongly India felt about Lakhvi and the fact that he was now out of prison, reported timesofindia.indiatimes.com Jun 24. India had moved the 1267 Sanctions Committee of the UN to seek an explanation from Islamabad over the alleged violation of the 1267 sanctions regime, which was passed in 1999, in releasing Lakhvi, commander of the terrorist outfit Lashkar-e-Toiba (LeT) and a close relative of its founder Hafiz Saeed. The Committee is made up of 15 countries – the 5 permanent and the 10 non-permanent members of the UN Security Council. China alone blocked the move, claiming India had not provided enough information to merit such an action by the UN. The other four permanent members – US, Britain, Russia, and France – joined by Germany, had expressed concern at Lakhvi’s release and Washington had called for him to be re-arrested. India’s Permanent Representative to the UN Mr Asoke Mukherjee had written to UN Sanctions Committee on May 3, saying Lakhvi’s release by a Pakistani court was in violation of the 1267 UN resolution dealing with designated entities and individuals. The resolution ensures that designated individuals face a travel ban, arms embargo and that their assets are also frozen. Lakhvi was under such sanctions since 2008. When all the representatives of the 15-member UNSC attended the meeting, held behind closed doors, panel chair, Jim McLay, New Zealand’s permanent representative, was in favour of calling Pakistan to just give an explanation on how Lakhvi, a UNSC sanctioned terrorist, furnished a bail bond of Rs 1 million. But China, a permanent UNSC member, objected, saying there was not enough information to summon them before the panel. India was not privy to the meeting. The Chinese action came despite the fact that during a recent bilateral meeting between Mr Modi and Chinese President Xi Jinping the two countries had reiterated their “resolute opposition” to terrorism in all its forms and manifestations and commitment to cooperate on counter-terrorism, the report noted. In the past too, Pakistan had banked on China to block moves in the UN Security Council against terrorist groups based in Pakistani territory, noted hindustantimes.com Jun 23. Just a few days after Mr Modi’s visit to Beijing, for example, China had put a technical hold on the introduction of Hizbul Mujahideen chief Syed Salahuddin in the list of banned terrorists of the UNSC panel, noted newindianexpress.com Jun 23.